The holiday season is a busy one. Our calendars and to-do lists fill up and make us a little frazzled, (maybe even a lot frazzled) and sometimes it feels like the entire month of December flies by at lightning speed. When this happens, I tend to get a bit of a homebody vibe going. I don’t want to go anywhere… I just want to be home and have all of my family home with me. One of my favorite holiday comforts is so simple that I feel kind of dorky sharing it, but here goes: I love having a fire in the fireplace and something yummy to drink. Yep. A fire and a beverage and I’m good, thanks. The boys even love it. They’ll lay there and just watch the fire. 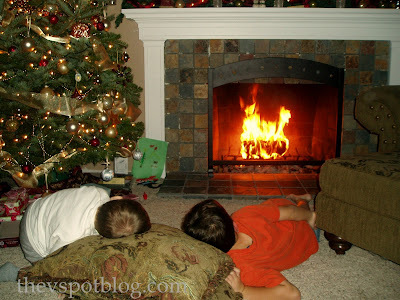 It’s nice to just be in the room and enjoy the fire and the Christmas tree and each other’s company. A perfect evening means that we’re playing a game together or watching a Christmas movie too. So there you have it… a roaring fire and a tasty beverage and I am one happy girl. What are some of the holiday comforts that you love? I have honestly never had wassil – it actually sounds good! I’ve heard of it but never knew the ingredients! I might have to try that. I know I’ve had wassail and liked it but it’s never around as much as hot cider. Funny thing is I’ve never thought to find the recipe!! But now that I have it I’ll have to make sure it’s included in our festivities!! 🙂 Thank you!! I love a fire in December too, especially when I’m decorating. Today it was almost cold enough to light it, it was a chilly 61. I may or may not be known to lower the AC to make the house feel cold so I can light the fire. 70’s in December is one of the few downfalls of living in Florida. I am feeling all warm and cozy just reading this post. I make something similar, my mom used to make it for us. I never thought of adding the Pineapple juice, but I make it almost exactly like yours. Going to try that. Got all of our Christmas mugs out this weekend and I am all set. I agree with this pass-time for well-earned lazy spells! We have a wonderful recipe for Wassail too! 😛 I just shared it on Our House Of Joyful Noise’s Facebook Page last week! It was a HUGE hit once again, this past Thanksgiving, as it simmered on the wood stove, with mugs and a ladle nearby.